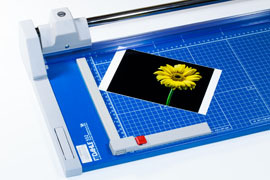 Dahle trimmers and cutters provide outstanding results. Whether you are trimming a single sheet of paper, photos, or cutting a ream stack of up to 700 sheets. Built for long life and durability - the Dahle line of cutters and trimmers represent the very best you can buy! With self-sharpening blades, durable construction and long life - this cutting equipment has been designed to provide you with a safe, fast and accurate cut every time. Rolling (Rotary) Trimmers are designed for safety and accuracy. The cutting blade can cut in either direction and self sharpen as work is performed. Precise, clean burr free cuts can be done on a variety of materials and material thickness. Cut material lengths from 0" to 72". Durable, solid metal base construction. Professional & Premium models available. 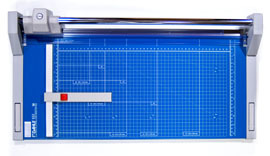 Guillotines or lever style cutters make easy work of cutting single or small stacks paper. 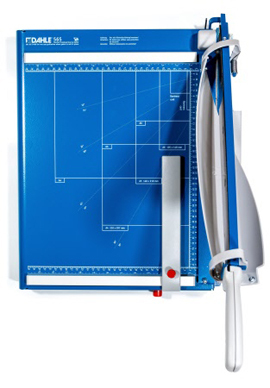 Dahle Guillotine blades will not fly up or drop down and use either a finger guard or rotary safety shield to prevent injury. The blades are made from long lasting hardened steel and never need sharpening. Cut material lengths from 0" to 27 1/2". Large Format Rolling (Rotary) Trimmers are designed for safety and accuracy. With a variety of lengths to choose from, you can cut single sheets, rolls of paper and other material. The rotary cutting action allows you to cut in either direction. Cut material lengths up to 72". 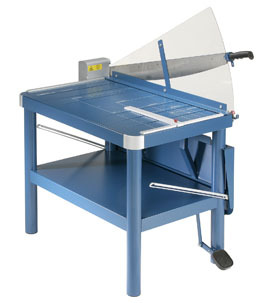 Large Format Guillotines or lever style are designed for larger cutting tasks. The ultra wide format and large work area allow for ease of use and provide years of worry free performance. Cut material sizes up to 43". Dahle Stack Cutters provide the utmost in precision and safety - all while cutting to 700 sheets of paper at a time. Each cutter has built in features that will increase the efficiency of your tasks as well as provide a safe and quick task oriented cutting experience. Cut paper stacks from 200, 500 & 700 sheets at a time. Durable, solid metal construction & optional floor stands. The models shown on this are specifically tested and recommended for photography, print, and scrap-booking oriented tasks. Designed for precision and performance - you may never buy another trimmer again! 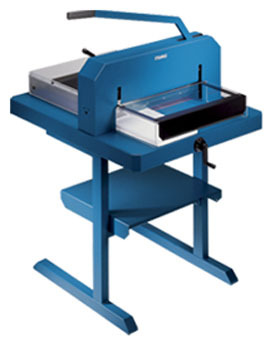 Multiple sizes and formats including Rotary & Guillotines. Long lasting, small, medium & large formats. Premium and Professional models available. For print shops, photographers, scrap-booking, arts & crafts and more!